"Come on!" he said. "Lets get out and have a walk," he said. Off we bowled in the car to Firle Beacon, which on a good day feels like being on top of the world. "Chocs away!" said the Boodle as the wind lfted his amazing aerodynamic ears! 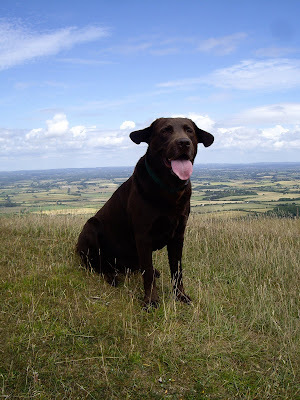 He is officially allowed to say "chocs away" being a choccy lab! I waxed on about the amazing smell on the breeze, how it smelt of dry grass and clover, the sea and salt.............................. Mr.Lane interrupted this outporing "It smells of Summer." He pronounced, and he was, of course absoloutley right! After an hour and a half of windswept walking we arrived at the pub, hooray! Lovely scrubbed sideboard, candles ready for dusk and such a pretty jug with lilies. Had to have a little meander through the village just to walk off lunch. I love, love Firle Stores, just as a village shop should be and still a Post Office too! The window boxes were glorious! They just made me feel really happy! Where the terraces of cottages are so comforting. The final treat came walking back to the car. What a picture perfect place to spend a summer day. Fantastic views and what a pretty village. Adorable chocolate labrador too. Best wishes. Heartfelt Thanks and a shameless plug!